True Instinct™ NO GRAIN is steam cooked, with a unique, complete and balanced, combination of natural ingredients. It provides nourishment without grains, and contains fresh turkey as the main ingredient, combined with an excellent selection of fruits and vegetables, such as peas, chickpeas, and potatoes; alternative carbohydrate sources to help maintain optimal health. Balanced level of high quality proteins and calories from fresh turkey to help maintain skeletal muscle and activity level. No grain recipe, with chickpeas, peas and potato as source of digestible carbohydrates. 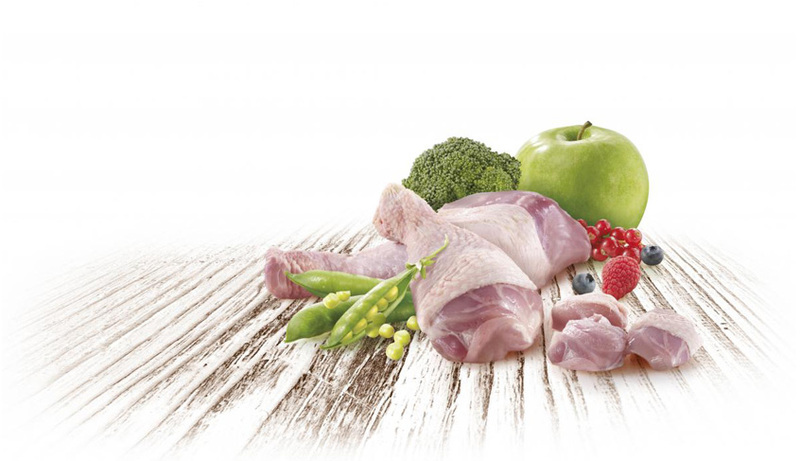 With fresh turkey, potato, peas, chickpeas and fibres with prebiotic effect. Omega-3 and Omega-6 essential fatty acids, and Zinc, to improve hair and skin quality and health. High level of antioxidants (vitamin E, C, Selenium), zinc and protein to support a healthy immune function. Turkey* (23%, with 4% de turkey thighs), chicken meal (22.5%), dried peas* (13%), pork meal (3%), dried potato*, pea flour*, lard (7%) (preserved with natural tocopherols), dried chickpeas*, protein hydrolysate (4%), beet pulp*, minerals, fish oil (0.5%), dried apple* (0.35%), dried carrot*, dried broccoli* (0.15%), dried red fruits* (0.01%). *Natural ingredients. Vitamin A: 30000 IU; vitamin D3: 2000 IU; vitamin E: 450 mg; vitamin C: 350 mg; ferrous sulphate monohydrate: 237 mg (Fe: 78 mg); potassium iodide: 1.7 mg (I: 1.3 mg); copper sulphate pentahydrate: 30 mg (Cu: 8 mg); manganous sulphate monohydrate: 112 mg (Mn: 37 mg); zinc sulphate monohydrate: 527 mg (Zn: 185 mg); sodium selenite: 0.2 mg (Se: 0.1 mg). With natural antioxidants.